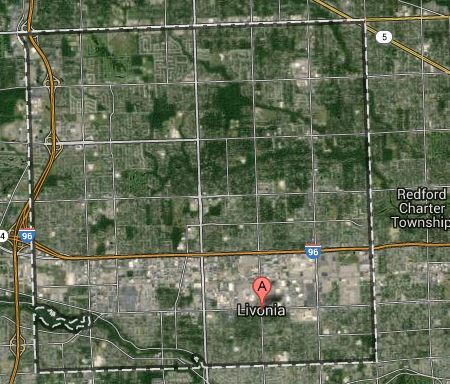 My home town of Livonia occupies an entire township block and it incorporated in the fifties in order to take advantage of the tax revenue generated by a racetrack in the center. When I moved here, there were still some cornfields and horse owners. Now it is a mature city. Realizing the need to preserve the roots of the city, Livonia took a farm in the northwest corner of our city and created Greenmead Historical Park which is a collection of houses, a store, a church, a station, a barn, and now another school. Henry Ford's donated school house near historic Nankin Mills will now be part of the Greenmead collection. It's nice to see these buildings being preserved. For those of us in the West, how big is a Township? Six miles square is a Township, as Tom said. One mile square is a Section, which is 640 acres. You can see most of the "Section Line" roads in Tom's pic. It's not uncommon to fine a road or street named Township (running east-west) or Range Line (running north-south) here in the Midwest. Those are the dotted lines above and are the borders of the Townships. Our major streets in Orange County are on quarter section lines, but we don't have townships. It's not so easy with mountains. Tom, thank you for posting this information. Had no knowledge of it. We lived in Livonia for a couple of years ('77 & '78) just off Middlebelt north of the DRC. We're definitely putting a "visit" to the Greenmead Park on our "to do" list for 2015! Cherry Hill NJ is a township that has 24.25 square miles and (now) 70,000+ residents. It was formerly named Delaware Township but NJ had two of them and when zip codes came along it had to be renamed. Prior to 1960, other than still scattered little villages along state roads...most of that square miles was farmland where the produce went to Campbell Soup.